Taoism is a religion often found in places like China and other areas in eastern Asia it also found in Korea. Taoism is at least 2,000 years old. Dao is the force. The force is believed to make everything in the world. According to Taoists, Dao is very mysterious. However, Taoists do not spend a lot of time trying to explain what Dao is, they focus on having a simple life in balance with harmony and nature. This is very important in Taoism. Taoists believe that problems and conflict is not good for them so if a problem arises they try to find a way around it. 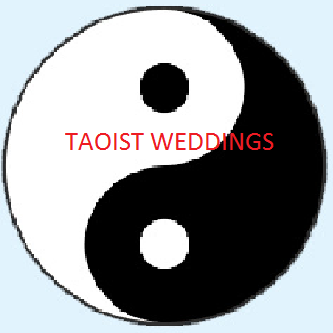 There is no specific place for a Taoist wedding to take place. They can take place anywhere. 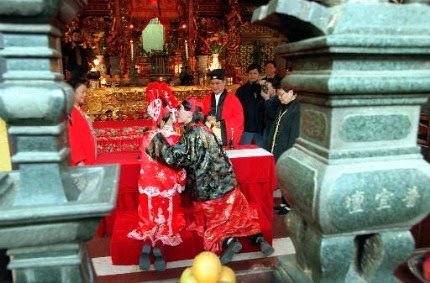 However, in a traditional Chinese wedding, the bride and groom would begin by sitting in the middle of the Pa Kua whilst they face one another. The pa Kua is an octagon shape. Inside, are the 8 forces of nature. These 8 forces are divided into yin and yang. The forces which are in the yin group are Wind, Water, Earth and Lake. The forces which are in the yang group are Heaven, Mountain, Fire and Thunder. When the couple sit in the Pa Kua, the bride sits protecting an urn filled with water. This represents the water element on the Pa Kua. The groom sits protecting an urn containing a lit candle. This would represent the fire element. And then surrounding the Pa Kua there are 8 candles symbolising each of the 8 forces of nature. Then everyone meditates to fill the room with a positive happy energy. The couple begin the ceremony by lighting all the 8 candles. After, "the spiritual union of the Tao" is read and then after the master of the ceremony greets everyone and reads "Understanding of the Tao". Then it is up to the bride and groom to exchange their written vows and the rings. This is the main part of the ceremony Then they have to read or give something to solidify the bond between them. Then in the centre of the Pa Kua the bride's water is poured onto the grooms fire. This creates steam. Joining together two opposing elements. Then the master of the ceremony performs the Pa Kua palm ritual outside the Pa Kua. This ritual is also called the sword. Traditionally, the wedding outfits would be red. This is because the colour red in China symbolises good luck. Like at Chinese New Year people are given red envelopes with money in them. However, you can wear other clothes like in traditional English weddings you could wear a white dress and a suit. Both of these photos are from Taoist weddings so it proves you can wear whatever you really want depending on where you are from. People from China are more likely to go with the traditional red outfit whereas people elsewhere might prefer to wear white. 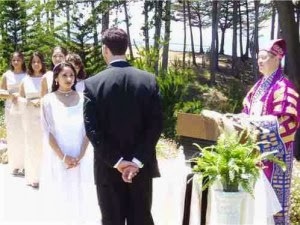 How is the wedding ceremony a sacrament?